Like so many local historical societies, the History Center's collections are a reflection of a specific time and place. Founded in 1911, the heart of our collection represents the lives of Andover Historical's founders and their families. They built our collection of artwork, tools and equipment, household items, clothing and accessories, and farming implements. Later in the 20th century, we began to expand and collect objects that reflect the larger Andover community. 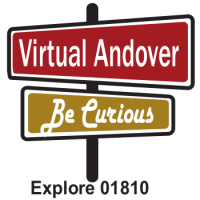 More recent additions to the collection include local advertising art for Andover businesses, military uniforms worn by Andover service men and women, and personal belongings that reflect family life in Andover. The best of our collections are supported by stories of the people who owned, used, or donated the artifacts. Stories that give greater meaning and understanding to who we are as individuals and a community. 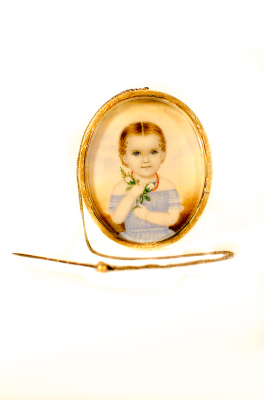 Brooch worn as a piece of mourning jewelry featuring miniature portrait of Jane Brabiner Dean, born July 11, 1847, died Sept 12, 1849. Most portraits of children at this time tried to capture the potential of a child in adulthood. This miniature portrait is different. Completed posthumously, this brooch was commissioned by the mother so that she might carry a portrait of her deceased child. 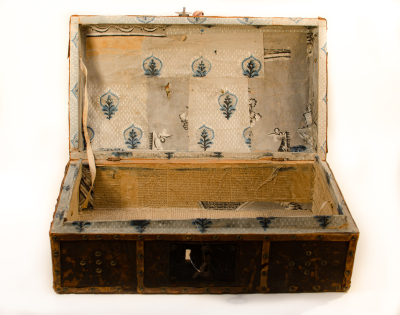 Small leather trunk with metal key. Lined with blue and grey wallpaper, as well as pages from the Independent Chronicle, a Boston newspaper, from Monday, October 21, 1793. This trunk made me wonder what type of treasures might have been kept in it. One pair of women’s gym sneakers made by Tyer Rubber. 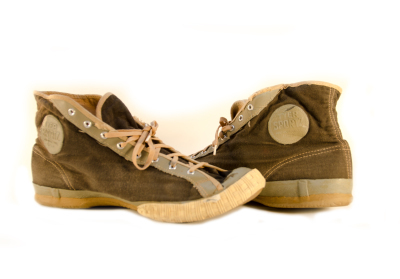 Tyer Sport model made of green canvas uppers with rubber soles. Tyer Rubber made women’s basketball shoes circa 1920. George Tyer patented the white rubber used in athletic shoes. 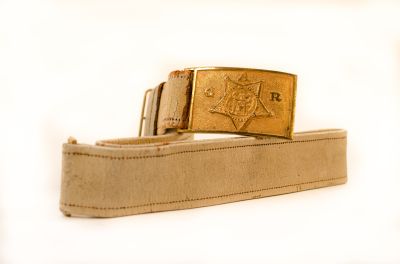 Grand Army of the Republic (GAR) belt belonging to E. Kendall Jenkins of Andover. Jenkins, born to Captain Benjamin Jenkins, a well-known abolitionist of his day, went on to hold multiple high level offices in Andover after the Civil War. He held the offices of Town Clerk, Treasurer of Essex County, Tax Collector, Trustee of Memorial Hall Library, Clerk of South Parish, and Deputy Sheriff.